Last Friday the Eagles kicked off their Annual Christmas Tournament on the basketball courts at Blackville School. 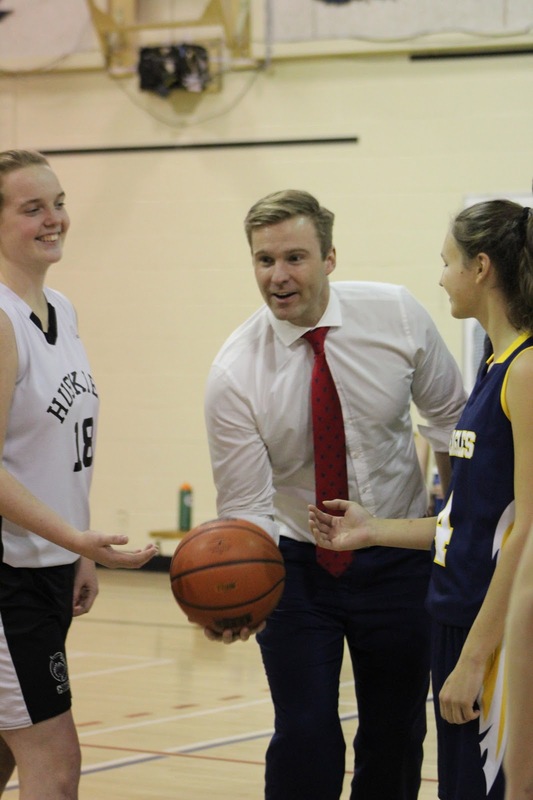 A crowd pleasing jump-ball was dropped by the New Brunswick Premier, Bryan Gallant. 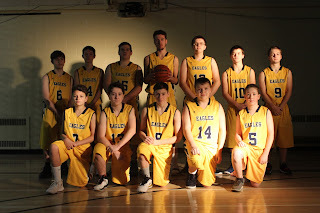 The Eagles had an amazing weekend of basketball going undefeated all weekend. The boys ended the weekend 4-0-0 and the girls ended with a 3-0-0 record. Both teams picked up the tournament trophies in close finals. This was another historic weekend for Eagles sports, as this is the first ever time both teams have won the tournament. The tournament started at 1:00 Friday in front of the entire high school crowd. The girls played a thrilling game in front of the school picking up a very convincing victory in front of the hometown crowd. The girls defeated Cambridge Narrows (CNCS) by a well rounded score of 48-35. 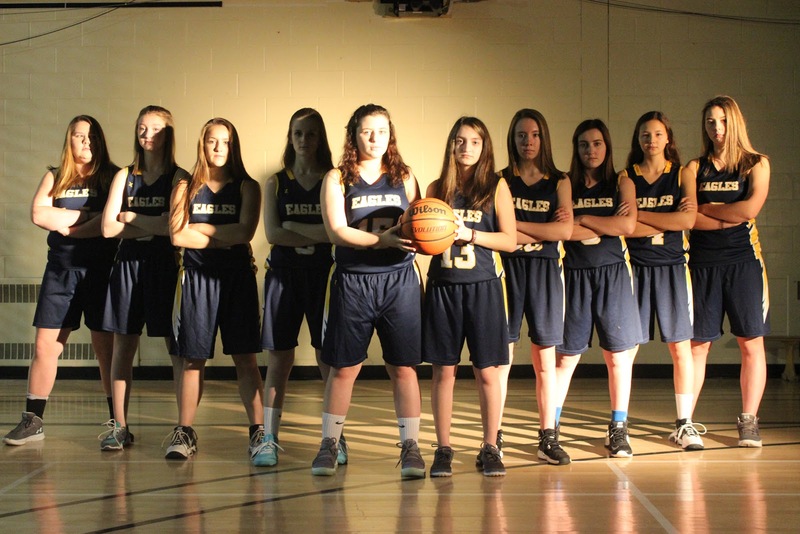 Leading the way for the Eagles was Abby Donovan with 22 points, Jayna Brennan with 16 points, Shelby Furlong with 4 points, Amber Walls, Hayley Underhill, and Tori Sullivan with 2 each. The player of the game for the Eagles was Amber Walls. The boys played at 2:45 following the girls game. They picked up a big win to start the tournament with confidence. The boys had a very well rounded attack in this one. Leading the way for the Eagles was Jesse Frenette with 25 points, Daniel Richard with 15 points, Devon Edwards with 13 points, Calvin Keenan with 12 points, Jacob Mercer with 6 points, Keaton Walls with 3 points, and Macaully Gillespie with 2 points. Player of the game for the Eagles was Rookie Devon Edwards. The boys followed this game up with a later 8 pm game against a very strong CNBA squad, who defeated our boys by 25 in a previous game last week. The boys came in angry and with a point to prove in this one, playing hard defence and knocking down all their open looks. The boys powered through and came out on the winning end by a score of 74-53. Leading the way for the Eagles was Daniel Richard with 26 points, Jesse Frenette with 24 points, Devon Edwards with 18 points, and Jacob Mercer with 6 points. Player of the game for the Eagles was Senior Jesse Frenette. The Eagles next game in the tournament was the following Saturday morning with the girls against a strong NSER squad. The girls battled hard defeating the NSER full-court press all game, picking up another big win to solidify their spot in the finals with an undefeated 2-0 round robin record. The girls won this one by a score of 72-64. 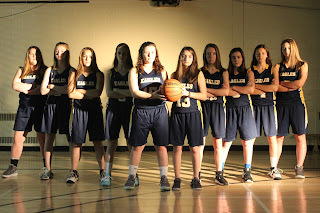 Leading the way for the Eagles was Abby Donovan with 30 points, Jayna Brennan with 21 points, Andrea Lynch with 7 points, Olivia Buggie and Tori Sullivan with 6 points each, and Shelby Furlong and Amber Walls with 2 points each. Player of the game was Jayna Brennan. The boys followed up the girls win by picking up their own in another close one against a strong Cambridge Narrows squad. This 60-55 win clinched the boys spot in the finals with an undefeated 3-0 record. Leading the way for the Eagles was Daniel Richard with 34 points, Jesse Frenette with 20 points, Devon Edwards, Calvin Keenan and Jacob Mercer with 2 points each. Player of the game for the Eagles was Daniel Richard. 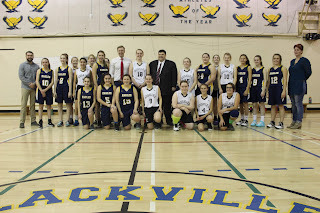 The next Eagles game of the tournament was the girls finals against NSER. This game was an absolute nail biter until the final quarter when the girls pulled ahead and held on for the 81-75 victory. Scoring for the girls was Abby Donovan with 44 points, Tori Sullivan with 16 points, Olivia Buggie with 9 points, Jayna Brennan with 8 points, Amber Walls and Andrea Lynch with 2 points each. Player of the game for the girls in this one was Abby Donovan. The grade 12 girls of this team were overjoyed winning this for the first time in their 4 high school seasons. The boys followed up the girls finals with an even closer final of their own. The boys kept it close all game trailing by 1 after the third quarter. Your boys never gave up though and managed to pull this one out by one basket; 76-74. Leading the way for the Eagles in this one was Daniel Richard with 34 points, Jesse Frenette with 30 points, Jacob Mercer with 8 points, and Calvin Keenan with 4 points. Player of the game for the boys in this one was Jacob Mercer. This is the second year in a row that our boys defeated CNBA in the finals of our home tournament to capture the trophy. We wish the best of luck to our teams going forward as they are having a great seasons so far. Go Eagles!